Fort Mandan offers visitors a unique chance to step back to a bygone era during their visit to the reconstructed fort. From 1804 to 1805, Fort Mandan was the Lewis and Clark Expedition's winter home. The fully-furnished rooms bring history to life as guests explore what life was like for Corps of Discovery's brave men more than two hundred years ago during the North Dakota winter. Reconstructed along the Missouri River in the riparian forest, Fort Mandan connects guests to the past through a virtual link. As visitors step through the fort's gates, they'll take in the smells, sounds, and sights of days long ago. The quarters of the fort, which are historically furnished with accurate reproductions, bring the living conditions to life that the members of the Expedition experienced. As they explore the fort, guests can view the field desk used by Meriwether Lewis, map-making tools used by William Clark, field equipment used by the during the Expedition, bunks used by the crew, clothes, and the forge of the blacksmith. Interpreters on sight at Fort Mandan offer tours and programs from April to October of the winter home of the 1804 to 1805 Expedition of Lewis and Clark. The nearby environment of the Missouri River beckons guests to explore and discover the area's natural history. Interpretive trails for walking, which wind their way under a majestic cottonwood canopy, connect the fort to the Fahlgren Memorial Park nearby, as well as offer several opportunities for recreation . Throughout the winter months, members of the Mandan-Hidatsa villages nearby were interviewed by Lewis and Clark to plot maps and work towards their expedition's next phase leading to the Pacific Ocean. They also luckily met the amazing young Native American woman by the name of Sacagawea. The Fort Mandan Visitor Center, which features a design based on a Mandan earthlodge, offers a classroom space, a museum store, and modern restroom facilities. Fahlgren Parks provides children with an area to play along with picnic shelters, offering a great place for visitors enjoy a picnic while surrounded by some of the oldest cottonwood trees in North Dakota. Fort Mandan, as well as the nearby Lewis and Clark Interpretive Center, provide student groups with learning experiences designed to appeal to a variety of learning styles. The museum's new exhibits, immersive replica of the fort, art displays, trained interpretive staff, and interactive interpretive programs all coordinate together to encourage wonder and curiosity about the heritage of North Dakota. Fort Mandan also welcomes bus and group tours. 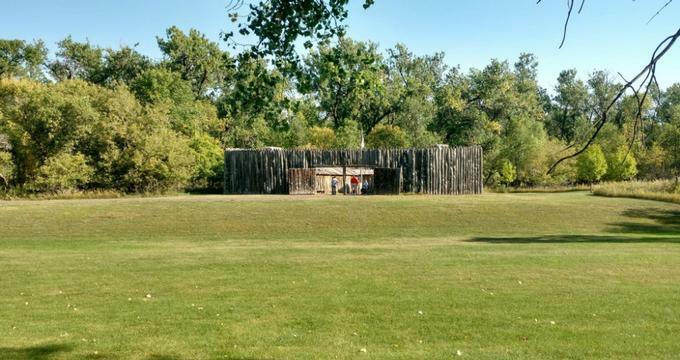 The Lewis and Clark Fort Mandan Foundation offers bus and group tours special rates as well if they schedule their visit to the fort in advance. Highly trained staff are able to adjust programming to meet the needs and interest of any group. The foundation responsible for the management and maintenance of Fort Mandan aims to celebrate history, culture, and art. The non-profit Lewis and Clark Fort Mandan Foundation is supported by numerous individuals throughout the state and the world, as well as other foundations and corporations.